Mills Creek is a unique collection of maintenance-free rental homes located in beautiful Maple Grove, Minnesota. Just outside of Minneapolis, this first-of-its-kind community is bringing generations together and amenities to your doorstep. Each tenant at Mills Creek will rent their very own free-standing home, adorned in the Modern Farmhouse aesthetic; timeless designs and elegant finishes that create an environment of tranquil sophistication. At no extra cost, each unit will be thoughtfully managed by a staff of round-the-clock professionals; diligently maintaining lawns, snow removal and landscaping. So whether you're a Millennial looking for the comforts while planning for the future, or an empty-nester wanting to scale back without abandoning the comforts you've earned, Mills Creek offers the convenience of multifamily living with the privacy and luxuries of a single-family home. 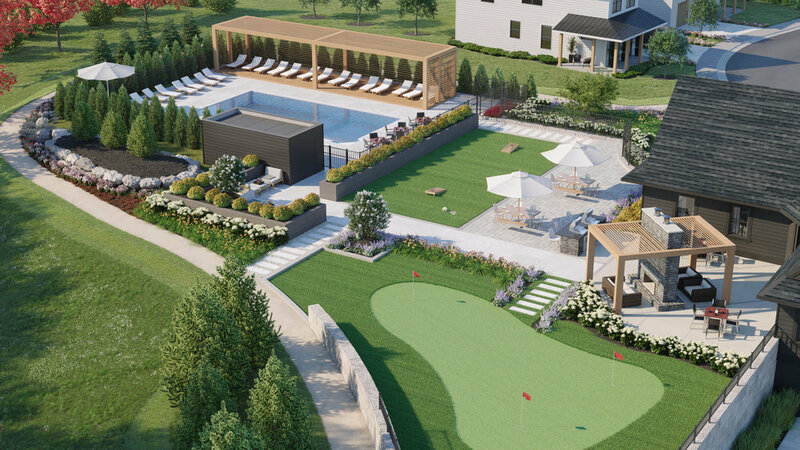 From well-appointed business and fitness centers to our clubhouse that features a pool, fire-side lounge, grilling stations, and putting green, Mills Creek provides tenants with an ideal platform for optimizing the moments that count. Mills Creek was designed to provide tenants with healthy and balanced lifestyles, which is the exact reason behind the community gardens and game lawns, available only for residents of the Mills Creek neighborhood. And for tenants with four-legged friends, enjoy our community’s generous green space, dog park and running trails, mere steps away from each unit. Carefully planted in the Maple Grove suburb of Minneapolis, Mills Creek is 15 acres of convenience, flexibility and amenities neatly packaged into a best-in-class community located mere footsteps away from the very best of Minnesota shopping and exploring. Mills Creek is a few minutes away from retail stores, supermarkets, and restaurants at Arbor Lakes, 20-minutes from bustling downtown Minneapolis, 45-minutes from the Minneapolis/St. Paul International Airport, and in close proximity to the nearby 1,000+ businesses. For adventure-seekers, Maple Grove consists of 7 lakes, 1,000 acres of parks, 36 miles of trails, and 48 playgrounds. Mills Creek is the premier destination for those looking to establish their own perfect blend of living, working and socializing. Sixty-six tastefully designed stand-alone homes offer a mix of 2, 3 and 4 bedroom models ranging from 1,200 to 2,000+ square feet. Designed by the highly-esteemed Haven Design Group, these homes will highlight a modern farmhouse aesthetic, featuring designer finishes, open concept floor plans and a top-of-the-line amenities package aimed to resonate with residents who appreciate elegant, yet gracious, living environments. Note, unit features vary by model and are subject to change. Enjoy a custom home-living experience like never before! Mills Creek is offering their residents the ability to customize their wall colors to fit their preferences. After choosing your preferred floor plan, choose your wall colors, and let the Mills Creek team do the rest. Find and build your perfect home without the costs of home ownership.